Ascending Butterfly: Take a “Road Trip” and win with Carolina Pad! This giveaway is now CLOSED. Thanks so much to our wonderful sponsor Carolina Pad! We look forward to working with you again! The winner is Janice Crespo. Congrats Janice! Remember: There are great giveaways active on the upper right hand side of the page! Watch for the next bag in the ‘Spring Into Bags’ series to launch SOON! Independence Day weekend is notorious for taking Road Trips. Which means juggling keeping the kids entertained, keeping track of your itinerary, receipts and more. With the economy still in a state of flux, more and more people will be taking 'staycations', or driving out to Amusement Parks and State Parks. I for one love Road Trips, especially with someone else doing the driving! I love to listen to music, sketch, doodle, and keep a travel journal. My travel journals end up looking more like a scrapbook by the time I am done because I'll add ticket stubs, pictures and more to my handwritten notes, but a travel diary has pretty much become a travel staple for me. That's where Carolina Pad comes in, they take everyday products, add a dash of extraordinary design and make crafting, school supplies and office needs fun again! I love Carolina Pad's site and think of them first when I'm ready to get new office products (especially for my home office! ), I love having the entire suite of office care needs coordinate with each other perfectly. And I don't know about you, but I am so over plain manila file folders! 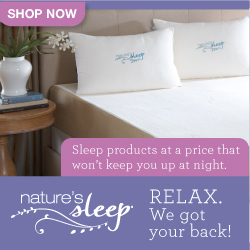 You all know I am all about shopping for a cause and working with companies that in some way give back. I was thrilled to find out about Carolina Pad's 2010 Commerce with a Conscience Collection! 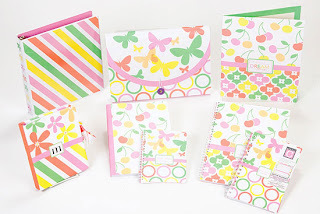 And OK the fact that the collection includes an array of pastel colored butterflies makes me just a wee bit biased I know. Dreamsicle, a stylish new collection of school and office supplies, was inspired by the Girls on the Run mission and its founder, Molly Barker. These products, part of the Commerce with a Conscience™ partnership between Carolina Pad, Girls on the Run, and JACK!E, will be available in major retail outlets including Walmart, Office Max, and CVS later this year. Girls on the Run® is a life-changing, experiential learning program for girls age eight to thirteen years old. The programs combine training for a 3.1 mile running event with self-esteem enhancing, uplifting workouts. The goals of the programs are to encourage positive emotional, social, mental, spiritual and physical development. 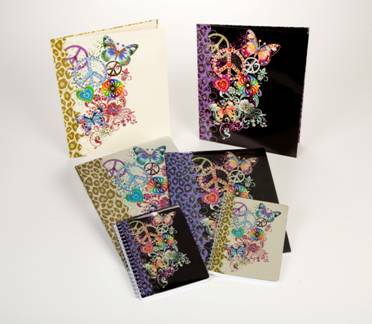 I was delighted to try the first collection from the Studio C brand – Road Trip. Again I will admit to being a bit biased due to the butterfly design, but it was pure genius on a road trip, I was able to use the two pocket folders to keep track of my planned itinerary, and the personal size notebooks came in handy for keeping a travel diary. I can't find one thing not to love about Carolina Pad, I love their products, and I love that they have a conscience; that they give back and want to empower young girls by bolstering their self-esteem and encouraging positive body, mind and soul development. Ƹ̵̡Ӝ̵̨̄Ʒ - How to Win: (1) You must be a PUBLIC follower of Ascending Butterfly to be eligible for this and all giveaways. Indicate in your entry that you follow (if your 'comment name/user id' differs from your profile id, please let me know what name you follow under) and (2) Visit Carolina Pad and pick a product you like and leave the LINK to that product in your comment entry! (3) You must also leave your email address somewhere in your comment. (You can format it this way for security, example: ascendingbutterfly AT mail host DOT com). (If your email is clearly visible in your profile, you can just say so, that's OK!) Please follow the easy 1, 2, 3 steps to winning This giveaway is open to USA residents who are 18 years of age or older. I voted for you on Fuel My Blogs! I follow via gfc. I like the techno notebook. I follow your blog- "Jennifer Hunter"
I am a GFC public follower, Nikki Davis. I follow carolinapad on twitter, nikkidavis05. I am an email subscriber, email address in blog. I like the Techno 1-Subject Notebooks.